Helping Others through Pastoral Care, Support Services, and Life Issues . We offer many areas of care for the homebound and hospitalized. From Eucharist, Hospital visitation, and assistance for the elderly and disabled, we have volunteers and staff available. Respecting Life from conception to natural death, care for the environment, and support for Missions near and far are very important areas in our church. Get involved or learn ways to support. 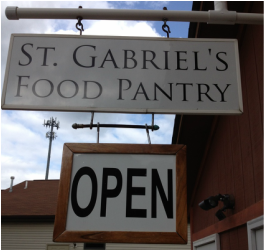 St. Gabriel is committed to help those in need. Our generous parishioners enable this through our Food Pantry, St. Vincent DePaul ministry, hot meal program and ministering to the incarcerated.